GLEANED FROM THE BLUE EYED SIX BOOK BY Edna Carmean: A true story from the late 19th century about four men who insured the town hobo and then hired a humble butcher and local ruffian to murder him so they could collect the insurance money…. all six having blue eyes! The system of justice moves forward for the three remaining members of the Blue Eyed Six, Israel Brandt, Jesiah Hummel & Henry Wise. Their partners in crime Charles Drews and Franklin Stichler are dead & George Zechman got off scot-free. What would happen to them? Henry Wise thought he got a get out of jail free ticket but did he? Brandt and Hummel clung to a thin hope that an appeal which was filed on their behalf to the Supreme Court would be approved giving them a re-trial, or as a last-ditch effort they prayed for grace from the Pardon Board. Time would tell and the clock ticked on. As the DA predicted, in the first week of December Wise was sentenced. With Wise standing before him in a neatly clad black suit Judge Henderson said, “Henry F. Wise, you were convicted of murder. Have you anything to say why sentence should not now be passed upon you?” Wise appeared calm and his voice was loud and distinct. “I have,” he said. “and I will show that the evidence against me was incorrect. May I have a Testament?” The Testament was provided. Wise opened it and raised an accusing finger. “I would like to show that Christ was condemned an innocent man, and it is much easier to condemn a sinful man.” He took from his breast pocket a written statement in which he had dissected the evidence and contradicted all the parts harmful to him. Christmas came and went. Then in the second week of January 1880 the Supreme Court met in Philadelphia to hear the appeals of Brandt and Hummel and it’s decision was announced a month later. It affirmed the decree of the Lebanon County court. There would be no new trial. Likewise, when the attorneys for the remaining three Blue Eyed Six argued their case before the Board of Pardons in the month of March the board could find no reason to interfere in the death sentences. Governor Hoyt fixed the day for execution, naming Thursday the 13th of May and sent the death warrants to a new Lebanon County Sheriff, Simon Crall. On the last day of March Crall went to each prisoners cell and read to them the death warrants. There was no more hope. As their day of reckoning approached, two of the men Brandt and Wise sought to make public their statements of faith. Brandt, who had earlier scoffed at the idea of accepting spiritual guidance, showed at last some stirring of religious fervor in a poem he wrote and gave to a reporter from the Harrisburg Independent. Brandt’s poem had no title but read: Verse 1: O loving wife and children dear; I love from heart you all; But I am here in jail secure; Hemmed in by lock and wall; But here I sing and pray; O Jesus take me o’er the way; Forgive me all my sins. Verse 2: Yes, Israel I was christened, Jesus’ name I see; In him I’ve found all comfort; O precious blood for me; Holy home I wish to go; My faith in Thee alone I show; For You will be my Savior. Verse 3: On God and not on mortal man; To build my hope I must; To gain my life’s salvation; With all my soul I trust; And when my walk is ended here; O take me to you Savior dear; O God Thy will be done. Face to face with the inevitability of morning and the waiting gallows, the three men spent their last hours in preparation for death. The YMCA (Young Men’s Christian Association) group came and held a service in each cell. Then Brandt expressed a wish to become a member of Salem Lutheran Church, and its pastor, the Reverend Trabert, received him as a member in his cell. Hummel was already a Lutheran and the two men took communion together. Pastor Trabert remained with them until after midnight. Wise had been baptized by immersion in Rausch Gap Creek in 1871 by the Reverend Israel Hay of the Church of God. Hay came to his cell to administer to him the Lord’s Supper and the rite of foot washing. After that Wise seemed completely happy and confident that his sins had been forgiven. The morning of May 13 dawned bright and sunny which was a sharp contrast to the cold November day on which Drews and Stichler were hanged. Birds sang and the air was sweet with the scent of lilacs and apple blossoms. Pastors for the three men were on the scene early in spite of having left the prison after midnight, and they stayed with their charges until the end. The prisoners, looking quite fashionable, wore white shirts and fresh paper collars with new suits which had been made for them by a Lebanon tailor. Their lapels were adorned by Lily of the Valley flowers provided a Miss Agnes Hartman of Lebanon. A few minutes before ten, Wise was visited briefly by Brandt and Hummel who told him they forgave him for what he had done against them. Wise replied that he had done nothing that required forgiveness and his visitors left. They never spoke to each other again. Wise had requested time to make a speech from the gallows and when Brandt and Hummel heard of it they protested, so an agreement was made for Wise to go the gallows first, give his speech and then the others would be brought out. It ended up being anticlimactic for when Wise was perched on the platform with clergy on either side of him he simply said, “I want you to know that we are all guilty as I testified. That is all I have to say.” His clergy continued and led the gathering in a hymn and the reading of Psalm 32 then closing with a prayer. Wise took part in everything, praying and singing more fervently than the ministers. After another hymn was sung by the crowd, the sheriff emerged from the jail with Brandt and Hummel. They were accompanied by two Lutheran pastors who read from the Lutheran Book of Prayer as they walked. On the gallows, neither Brandt or Hummel spoke to Wise and he gave no sign of recognizing them. They all knelt for a brief prayer after which the ministers shook hands with the prisoners and left the scaffold. Sheriff Crall came up the steps and asked Brandt and Hummel if they had anything to say. They merely shook their heads in the negative. Then as the three men stood in a line facing the crowd their legs were tied together, their arms pinioned behind them, the ropes were adjusted around their necks and the white caps drawn over their faces. As Crall walked down the steps he struck the spring, the trap door opened, and the men dropped with a thud to the end of their ropes. They hung still and unmoving in spite of the fact that all had died of strangulation. No necks were broken, the knots had slipped. The fragrant flowers of Lily of the Valley in their lapels hung limp and drooping. The crowd dispersed quietly and soberly. 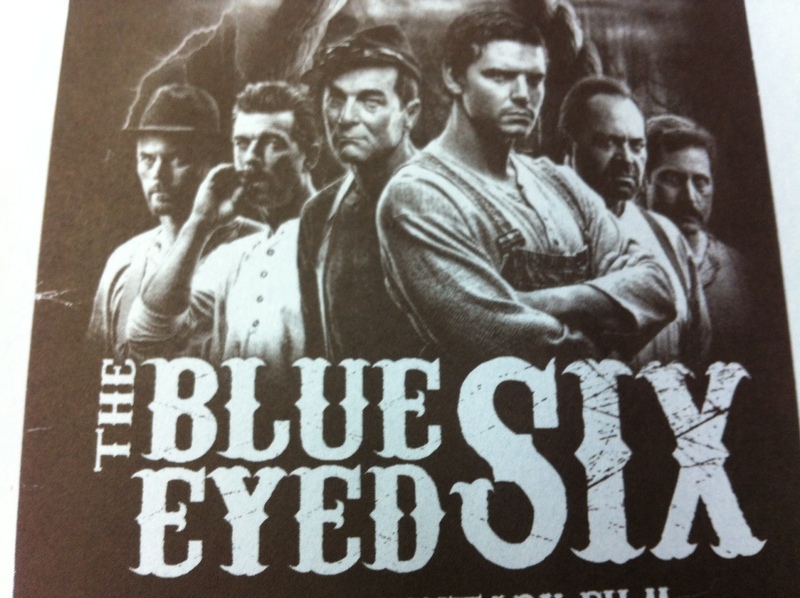 The case of the Blue Eyed Six had ended! LOBO COMMENTS: I began these blogs on the Blue Eyed Six almost a month ago on September 19th thinking it would be a simple thing. After an estimated 60 hours of writing not to mention all the reading, I have learned so much! I knew that two of these men were in my family tree but could not have told you which ones for the life of me. After scouring through my Uncle Wayne Anspach’s book, and then being given a copy of Edna Carmean’s book as well (by my twin brother Bruce) my mind is now indelibly imprinted with each man’s face and story. When I’m out in the community, most recently at the Levitz Park Apple Festival, I continue to meet people who say, “I’m related to one or even two of the Blue Eyed Six!” As a Christian, and student of God’s Word for over 40 years, I am fascinated by the thread of religion (man’s efforts to reach to God) and true Faith in Jesus (God’s way to reach man) which is clearly seen in this story. For me, the age-old fascination of their story of evil and murder was enlarged to also include the story of a faithful God who continues to pursue the sons of Adam until their dying day, in order that they might receive new life through His message of love and forgiveness which Jesus accomplished on the Cross. As a poet once said, “God sent his singers on the earth, with songs of gladness and of mirth. That they may touch the hearts of men, and bring them back to heaven again.” Walk with the King today and be a blessing!